CARACAS - The US has been told it will need to ‘send in the Marines’ if it’s going to get Venezuela to comply with a regional plan. The crisis-hit country’s foreign minister goaded the United States by saying that this would be met by a ‘crushing response’. Delcy Rodriguez hit out at plans to send in regional mediators following months of violent street clashes which have so far claimed 74 lives. Delcy Rodriguez said the only way to impose the plans would be to send in the Marines – but they would be met with a ‘crushing response’. 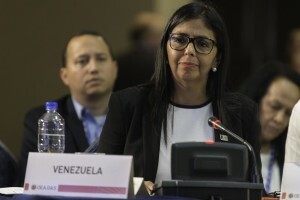 Rodriguez said at a meeting of the Organization of American States (OAS) in Cancun, Mexico that the US was only interested in Venezuela so it could take advantage of oil reserves. She said: ‘The “contact group” you’re proposing is completely useless and unnecessary. The outburst came after a proposal to mediate the crisis was made by US Deputy Secretary of State John Sullivan. It came as foreign ministers failed to reach an agreement on how to respond to the crisis in Venezuela. The government of Nicolas Maduro is facing calls to step down amid widespread food shortages and huge inflation. Venezuela is currently in the process of leaving the OAS and said it would not respect decisions reached. A draft resolution backed by the US fell three votes shy of the 23 it needed to be adopted by the 34-nation group. Sullivan is now pushing to take the matter up in the OAS General Assembly, which is also convening in Cancun this week, and where the vote threshold is lower – a simple majority of 18 votes. Rodriguez also lashed out at other countries that supported the US-backed proposal. She referred to Peru as a ‘lapdog of imperialism’ and called Costa Rica’s foreign minister a ‘political illiterate who knows nothing about Venezuela’. Violent clashes between protesters and police have become a common sight across Venezuela in recent months.